Since I received the DVD of high resolution aerial imagery and maps from the Isle of Man Government last week, I've spent most of my spare time starting to digitise information for the OpenStreetMap project. 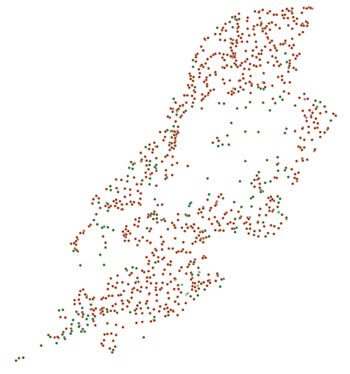 Using QGIS to load in the data, I started to gather all the names from the map that I could, including both place names (for small local areas, hamlets and villages that weren't already in the database) and also farm names. With over a thousand names, this is already a massive boost to the data in OpenStreetMap as it is data that would have been immensely difficult to gather on the ground. 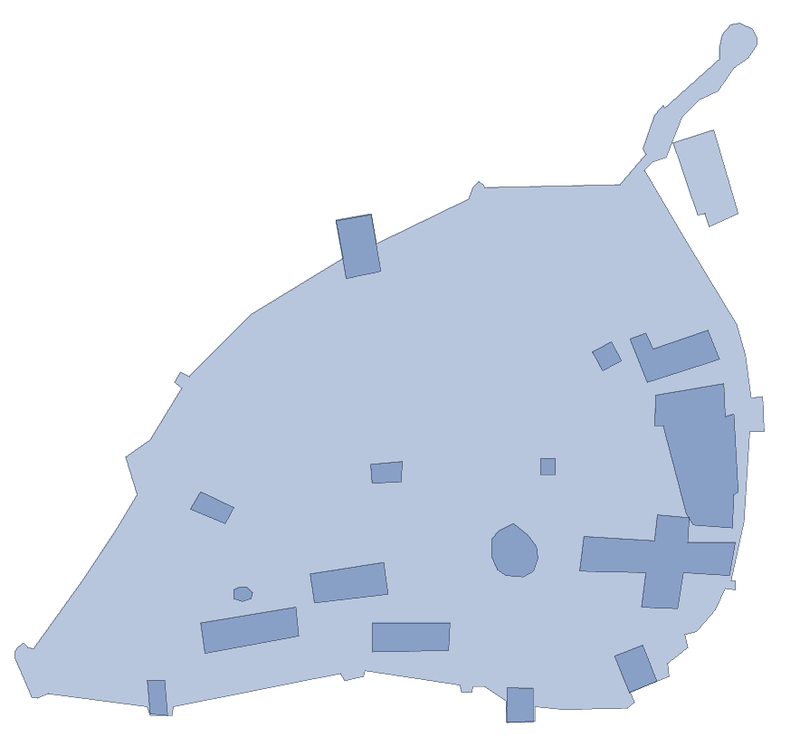 The image to the left represents the shape of the Island, made up of all the points obtained from the map, and soon to be imported into the main database. 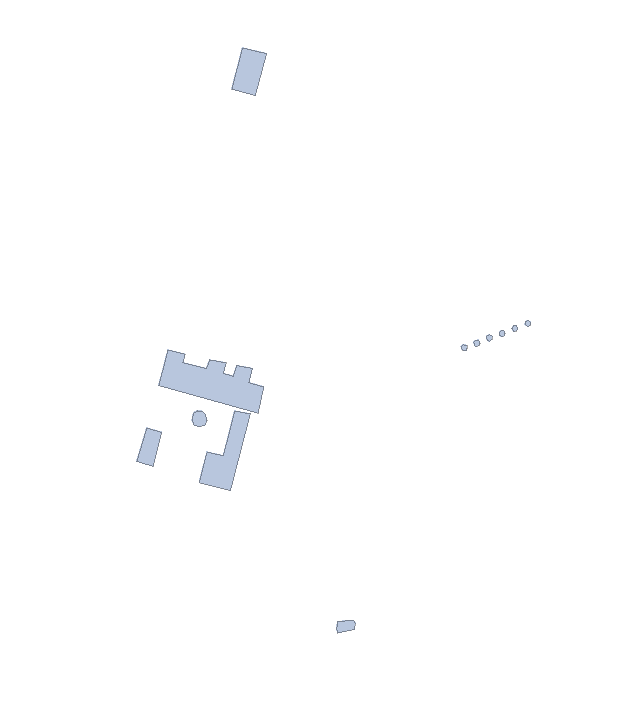 The three images below are of small areas that I have started to digitise the buildings of. 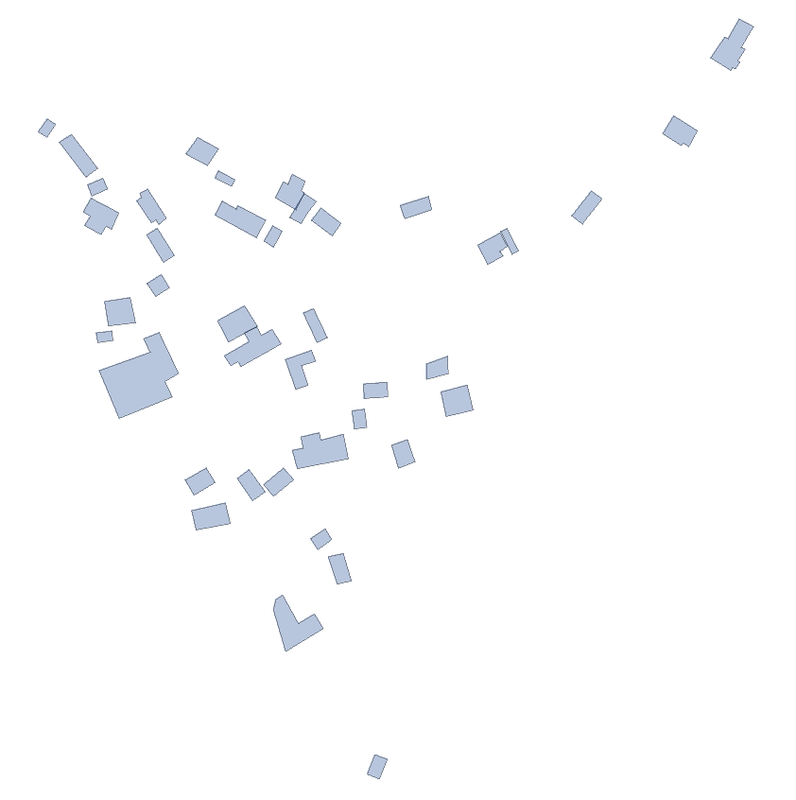 I'm offering a prize (a pint at the next London mapping party perhaps) to the first person to guess all three places correctly. Two of them may well look familiar to anyone who I chatted to at the 5th birthday party of OpenStreetMap. Most of the data in the images above (and future data others would like to extract for OpenStreetMap) would have been impossible (well, certainly extremely impractical) to gather were it not for the very generous support of the Isle of Man Survey in giving us a license to derive this information, for which I'm personally very grateful, and I know a lot of other people in the project are also excited about. These images are licenced as CC-by-SA and the data behind them all will be in the OpenStreetMap database very soon. 2. Cregneash Village. Quite easy. 3. St.Patrick's Isle - Old ruined cathedral and castle buildings. Very easy. I doubt if I am the first to work this out, but thank you for the opportunity. If you do make a map of the Isle of Man, PLEASE spell "Tholt-y-Will" with a "y", as on all government official notices of Rally road closures, etc., and as approved of by all the inhabitants there a few years ago, and including Forestry Commission, Electricity Board, and even as in the official "Tholt-y-Will" cachet produced about 100 years ago, and O.S. maps up until about 15 years ago, when they went over to an "e". Your local knowledge of the Island could be very useful to the project if you're interested in helping out. The issue of names is interesting, but thankfully we can store different versions of a name in OpenStreetMap. The version with the -e- is what is shown on the official Isle of Man Government 1:25000 map I believe, but if its agreed locally that the -y- version is correct, we can use that as the main spelling. It would be good to feed things like this back to the Isle of Man Survey as and when issues are noticed, so the generally accepted local version can be shown on their maps. Perhaps the switch to -e- is more in keeping with the original Manx name though? Even though the O.S. changed the name on their maps from -y- to -e- a few years ago, (and the IoM Gvt map has followed suit,) all the official government notices in the papers about road closures etc have stuck with the original spelling. When we had the Craft Centre at Tholt-y-Will I particularly asked a Manx speaker on his views about the spelling, and he thought that "y" was more appropriate. There probably is no wrong answer, as for many years the language was only spoken rather than written, and variations naturally occurred when subsequently written down. However, when the Manx Electric Railway issued postcards for visitors, and an official Tholt-y-Will cachet was introduced 100 years ago in 1909, that is how it was spelt. The cachet was reintroduced in 1995, after a long absence, and for the first day covers the IoM Post Office accompanied the new cachet with an official "Tholt-y-Will" cancellation. Unfortunately some newer signs are being influenced by the spelling on the current O.S. maps, which is understandable, but I hope you will be able to reverse the trend, and reinstate the original spelling.